The Lunar and Planetary Science Conference will see two Io Volcano Observer posters. 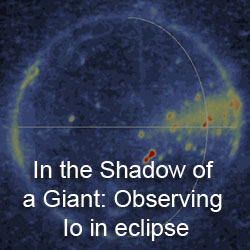 The first, by Alfred McEwen et al., is titled "Io Volcano Observer (IVO)". This poster will provide an overview of the mission concept, with the abstract providing quite a few details of the planned payload. The second, by Keszthelyi et al, is titled "Optimal Wavelengths for Studying Thermal Emission from Active Volcanoes on Io". This poster will look at some of the work that has gone into filter selection and instrument design for IVO's radiation-hard camera (RCam) and Thermal Mapper (ThM). Much of the information in McEwen's abstract was previously reported on in my post, The Uber Io Volcano Observer Post, so I don't think I need to completely repeat myself. The abstract does include a clearer description of the imaging system to be used on IVO, RCam. The camera would use a 2000x2000 CMOS detector. The half of the detector will allow RCam to be used as a clear-filter framing camera, for taking opnav,clear filter global images, and plume movies. The other half "will be covered by up to 15 spectral filters from 200-1000 nm, each covering ~64 lines for digital Time-Delay Integration (dTDI)." For 256 lines, the instrument will have 16 sets of 4 filters, with each filter using 4 lines. The four filters McEwen's suggests using are 400-600 nm (blue-green), 600-800 nm (red), >800 nm (IR1), and >950 nm (IR2). This would allow RCam to take near-simultaneous color images that will be necessary for measuring the hottest lava temperatures as they can change over times scales of less than a second. Other filters that RCam could use include UV bandpasses (for atmospheric processes and for looking at SO2 frost), other narrow filters for looking at atmospheric composition (Na, O), mineralogy bandpasses from 800-1000 nm, and methane bands (for looking at Jupiter's atmosphere). The second abstract by Keszthelyi et al. takes a look at the best filters to use on RCam and Thermal Mapper for measuring lava temperatures. Different bandpasses would work best for measuring lavas of different ages. For example, RCam would be used to look at lava less than a second after they emerge from the surface (such as at a lava fountain) as well as magma in lava tubes made visible through skylights. This would be supported by the two near-infrared bandpasses on RCam. 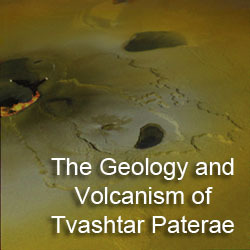 Ratioing pixel values between the two would allow scientists to calculate eruption temperatures between 1200 and 1800 °C. The digital Time-Delay Integration system used by RCam would also support the need for less than 0.1 seconds between acquisition of the different color filter data. 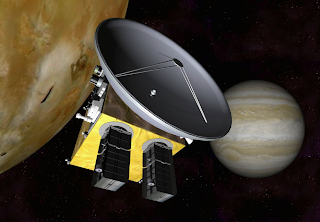 The Thermal Mapper will use up to 10 bands in the infrared portion of the spectrum to examine Io's surface composition, thermal inertia, and thermal emission. Some of the bands that will be included would be selected based on the type of volcanic process mission scientists wish to examine. 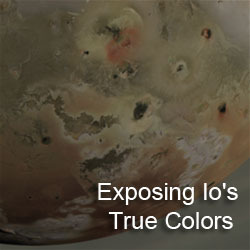 These processes occur at different time scales, which based on the cooling rate of lava on Io, can be related to different peak temperatures. The wavelengths picked (2, 3, 4, 6, and 8 microns) were chosen because they cover peak emission wavelengths for each of the time scales the scientists want to look at (processes that occur over a period of seconds, minutes, days, and months). Other bands the scientists would hope to include are 15 and 20 microns that would be used to search for SO2 at its triple point as well as to look at global heatflow. Additional bands could be included to search for the Christiansen Feature between 7.5 and 9.5 microns, which would provide additional information on the mineralogy of Io's lavas. The Christiansen Feature increases in wavelength with decreasing SiO2 content. So the CF for minerals typical of felsic lavas like rhyolite would be closer to 7.5-8 microns, while the CF for minerals typical of mafic lavas, the dominent type on Io,would be closer to 8.5-9.5 microns.